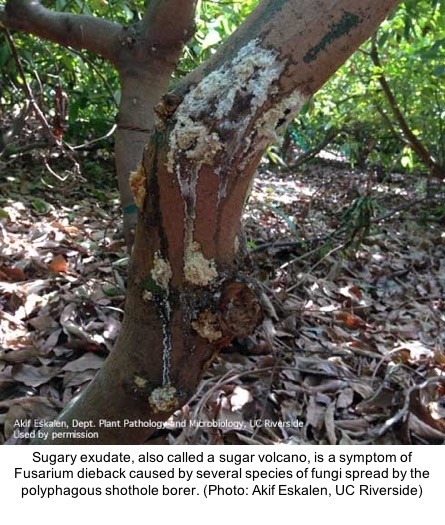 A sugar volcano is one symptom that shows your avocado tree might be infected with Fusarium dieback, a fungi spread by a beetle called the shothole borer. But what you might see if your tree is being attacked by shothole borer, varies among the different kinds of tree hosts. The symptoms—staining, sugary exudate, gumming and beetle frass—are often noticed before the tiny beetles (1.5–2.5 mm) are found. As its name suggests, these beetles bore into trees. Near or beneath the symptoms, you might notice the beetle's entry and exit holes into the tree. The female tunnels into trees forming galleries, where she lays her eggs. Once grown, the sibling beetles mate with each other so that females leaving the tree to start their own galleries are already pregnant. Males do not fly and stay in the host tree. Shothole borers have a special structure in their mouth where they carry two or three kinds of their own novel symbiotic fungi. Shothole borers grow these fungi in their tree galleries. It's these fungi that cause Fusarium dieback disease, which interrupts the transportation of water and nutrients in the host tree. Advanced fungal infections will eventually lead to branch dieback. Avocado is one tree host. Shothole borers successfully lay eggs and grow fungi in many tree hosts, with some of these trees susceptible to the Fusarium dieback disease. For more information about tree host species, where the shothole borer is in California, and what symptoms look like in other tree hosts, visit the UC Riverside Eskalen Lab website. Content in this post taken from the UC IPM Avocado Pest Management Guidelines. Faber BA, Willen CA, Eskalen A, Morse JG, Hanson B, Hoddle MS. Revised continuously. UC IPM Pest Management Guidelines Avocado. UC ANR Publication 3436. Oakland, CA. Learn how to recognize the signs of invasive shot hole borer and gold spotted oak borer infestations in native and landscape trees. Each training will cover how to recognize signs, symptoms, active and inactive populations, take field samples, treatment options, proper handling and disposal of green waste. These trainings were initially offered as part of a series with two live webinars, which have now past – if you did not attend the webinars, unfortunately, these trainings alone will NOT offer CEUs. AS OF 5/3/2018, THE ONLY FIELD TRAINING WITH SPACE REMAINING IS THURSDAY, MAY 17TH, O'MELVENY PARK, LOS ANGELES COUNTY. IF YOU CANNOT ATTEND THIS TRAINING, DO NOT REGISTER. Ambrosia beetles comprise a group of over 6,000 species in the Scolytinae subfamily. Most of these beetles typically attack decomposing and dead trees. The Polyphagous/Kuroshio Shot Borers have been reports on over 300 landscape and wildland living tree species, including avocado. Decline and death of trees has been noted in California since 2012, and the full economic extent is still unclear. The beetles feeds on a fungal symbiont that is introduced into the tree, and it is the fungus that spreads throughout the tree and causes the tree decline and death. What was once thought to be another species of beetle (Tea Shot Hole Borer) and then identified as a new species - Polyphagous Shot Hole Borer- and now expanded to include another species of borer – Kuroshio Shot Hole – is showing that its fungal partners can be quite diverse. A recent publication indicates the increasing tangled association of the shot hole borer/disease complex that is affecting avocado and other tree species. 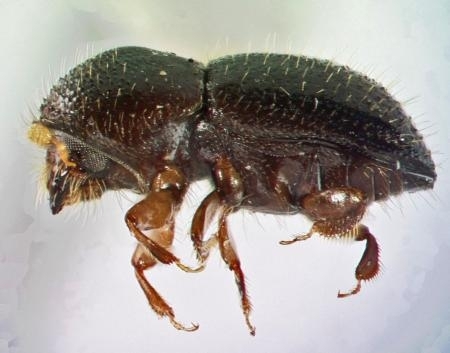 Shot hole borer (SHB)-Fusarium dieback (FD) is a new pest-disease complex affecting numerous tree species in California and is vectored by two distinct, but related ambrosia beetles (Euwallacea sp. nr. fornicatus) called polyphagous shot hole borer (PSHB) and Kuroshio shot hole borer (KSHB). 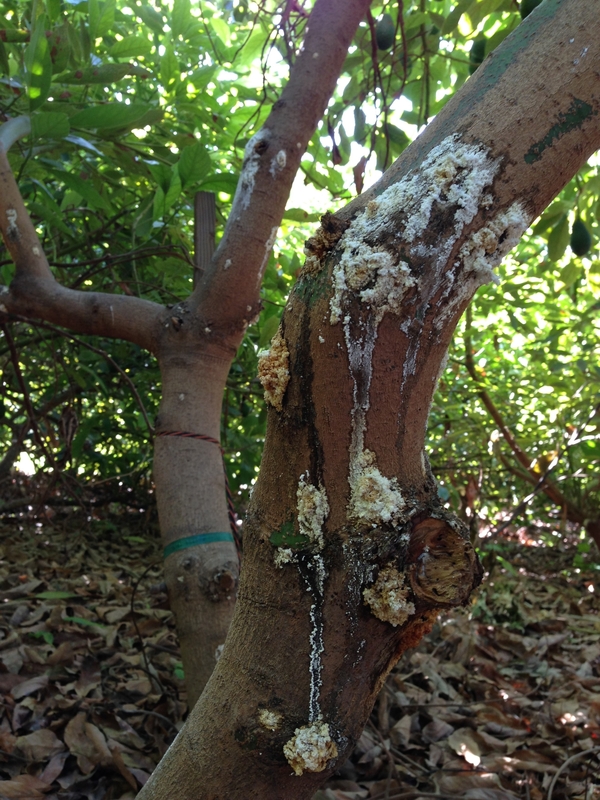 These pest-disease complexes cause branch dieback and tree mortality on numerous wildland and landscape tree species, as well as agricultural tree species, primarily avocado. The recent discovery of KSHB in California initiated an investigation of fungal symbionts associated with the KSHB vector. Ten isolates of Fusarium sp. and Graphium sp., respectively, were recovered from the mycangia of adult KSHB females captured in three different locations within San Diego County and compared with the known symbiotic fungi of PSHB. Multigene phylogenetic analyses of the internal transcribed spacer region (ITS), translation elongation factor-1 alpha (TEF1-α), and RNA polymerase II subunit (RPB1, RPB2) regions as well as morphological comparisons revealed that two novel fungal associates Fusarium kuroshium sp. nov. and Graphium kuroshium sp. nov. obtained from KSHB were related to, but distinct from the fungal symbionts F. euwallaceae and G. euwallaceae associated with PSHB in California. Pathogenicity tests on healthy, young avocado plants revealed F. kuroshium and G. kuroshium to be pathogenic. Lesion lengths from inoculation of F. kuroshium were found to be significantly shorter compared with those caused by F. euwallaceae, while no difference in symptom severity was detected between Graphium spp. associated with KSHB and PSHB. These findings highlight the pest disease complexes of KSHB-FD and PSHB-FD as distinct, but collective threats adversely impacting woody hosts throughout California. Invasive species are a problem world-wide and this is an example of how invasives can arrive in multiple countries at the same time and/or how possibly they might move from somewhere like California to another far away country like South Africa. People are the usual agents for carrying these pests around the world. The polyphagous shot hole borer (PSHB), an ambrosia beetle (Coleoptera: Curculeonidae: Scolytinae) native to Asia, together with its fungal symbiont Fusarium euwallaceae, has emerged as an important invasive pest killing avocado and other trees in Israel and the United States. The PSHB is one of three cryptic species in the Euwallacea fornicatusspecies complex, the taxonomy of which remains to be resolved. The surge in the global spread of invasive forest pests such as the PSHB has led to the development of programs utilizing sentinel tree plantings to record new host-pest interactions. During routine surveys of tree health in botanical gardens of South Africa undertaken as part of a sentinel project, an ambrosia beetle/fungal associate was detected damaging Platanus x acerifolia(London Plane) in the KwaZulu-Natal National Botanical Gardens, Pietermaritzburg. Identification of the beetle by sequencing part of the mitochondrial cytochrome oxidase c subunit 1 (COI) gene confirmed its identity as PSHB, and specifically one of the invasive haplotypes of the beetle. The associated fungus F. euwallaceaewas identified based on phylogenetic analysis of elongation factor (EF 1-α) sequences. Koch's postulates have confirmed the pathogenicity of fungal isolates toP. x acerifolia. This is the first report of PSHB and its fungal symbiont causing Fusarium dieback in South Africa. This report also represents the first verified case of a damaging invasive forest pest detected in a sentinel planting project, highlighting the importance of such studies. Given the potential impact these species present to urban trees, native biodiversity and agriculture, both the PSHB and its fungal symbiont should be included in invasive species regulations in South Africa. Photo: Infected sycamore which is related to London plane tree.